Oh yeah, and the two of them have superpowers." 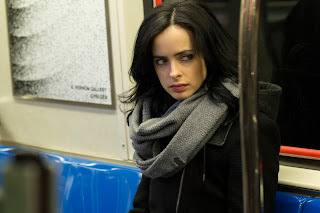 You guys, I submit to the court that Jessica Jones is freaking amazing. On my second viewing, I'm noticing other things that make its world seem vividly real. It's set in a New York that is not (as is so often the case in TV Land) populated entirely and inexplicably by white people. It has a load of ladygay characters whose ladygaiety is not the entire point of their characters. It's like Veronica Mars and Buffy got together to talk about all the things they didn't get right and had a beautiful foul-mouthed baby.